Prevention of mold growth indoors cannot be achieved without proper moisture control. Control the moisture and you control the mold. Protect your family. In the summer, air conditioning can de-humidify indoor space. But if the system is too large or too small for the space it serves, the cooling system can create high humidity by cooling without removing water vapor. A properly sized and maintained system will dehumidify and cool a building. When there are cold surfaces in a building, water vapor can condense on those surfaces, just as water condenses on the outside of a glass of ice water. Proper insulation of exterior walls can help prevent condensation and mold growth during the winter. You should always be mindful of indoor sources of water vapor that can be problematic. Clothing dryers must be vented to the outdoors. Unvented gas or kerosene space heaters can generate enormous amounts of water vapor (as well as other air contaminants), and should be used sparingly and never as a primary heat source. Always run the bathroom exhaust fan when showering or bathing, and make sure the vent is exhausted to outdoors. A properly vented kitchen exhaust fan can remove steam created during cooking. Mold requires 3 basic elements to grow: Moisture, warm air and a food source. Depriving mold of any of these three items will limit, and in some cases prevent it from growing, but it will not kill the mold that is already present. 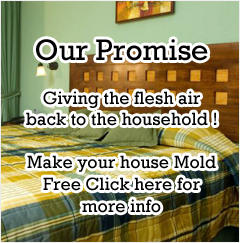 Mold spores will remain dormant, and if the moisture, warmth and food all reappear, mold will begin to grow again. Remember, mold does not have to be alive to cause health problems in people or animals. Dormant and even non-viable (dead) mold can be just as harmful as viable (alive) mold. (1) The most important steps in controlling mold growth are to remediate any existing mold and to eliminate moisture intrusion that caused it. (2) The #1 cause of indoor mold problems is outdoor irrigation and drainage. Wall materials such as stucco and wood absorb water. Make sure sprinklers do not hit exterior walls. Make sure plants do not touch exterior walls and rain water is routed away from your building. 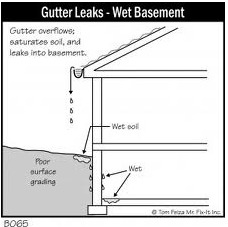 Gutters and downspouts are the best way to manage rain water. Concrete slabs act just like a sponge. They absorb water out of the soil and hold it for extended periods. In turn, materials that make contact with wet slabs, such as carpet, padding, tack strip, moldings and other construction framework, absorb moisture out of slabs creating ideal conditions for mold growth. Over watering plants, grass and flower beds, is the primary contributor to this destructive scenario. When watering, make sure that the soil against your building dries completely within 3 hours of watering. (3) Cob webs and dust are mold magnets. Airborne spores get trapped and can begin to grow. Vacuum and clean regularly to remove dust and cob webs in your home, especially behind refrigerator and other appliances that are not always included in routine vacuuming. (4) Carpeting in bathrooms and basements is not recommended. In portions of your home that are susceptible to moisture, use area rugs or washable floor surfaces rather than wall-to-wall carpeting. If you use area rugs, launder them periodically. (5) Do not store materials such as paper, books, clothes or other possible sources of food for mold in humid parts of your home. 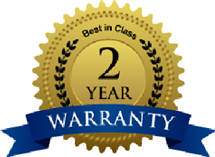 (6) Repair water leaks in your roof, windows or any other part of the home immediately. properly, moisture can build up and mold can grow there. 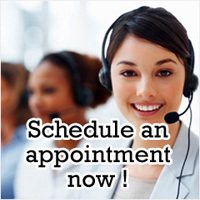 Remove any mold on the door gaskets and replace faulty gaskets. (8) If you live in a house, make sure that your gutters and downspouts are clear of debris that may block the flow of water from your roof. Make sure the area under your downspouts is properly graded so that rainwater from the roof flows away from your foundation. Splash blocks can help rainwater to flow in the proper direction. If necessary, extend your downspouts. (9) Make sure other areas around your foundation are graded so that rainwater does not flow toward the house. Do not put gardens or plants too close to your foundation so that watering them could cause water to flow toward your house. If you water your lawn with a sprinkler, make sure the water does not hit your house or the area next to the foundation. (10) In the kitchen and bathroom, open windows or use exhaust fans when engaging in activities that produce moisture. Exhaust fans should be vented to the outdoors and not to an attic or crawl space. If your shower areas do not have exhaust fan, install them and wire them to the light switch so they cannot be ignored. (11) If you have a clothing dryer, make sure it is properly vented to the outdoors. (12) If you use a humidifier, make sure it does not produce an excessive amount of humidity. During the summer, 60 percent relative humidity or lower probably will prevent condensation and mold growth in most parts of the country, but that is too moist for the middle of winter, when 40 percent relative humidity or lower will prevent condensation on windows. 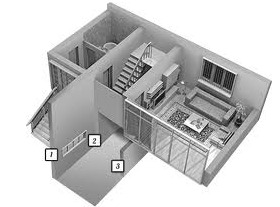 (13) If you live in a house with a basement, consider using a dehumidifier there. The cool basement floor and walls can be a source of moisture build-up. (14) If your home has an attic, make sure it is properly insulated and ventilated. (15) If you have a crawl space under your house, cover the soil in the crawl space with waterproof polyethylene plastic. If your crawl space is ventilated, close the vents in the summer and keep them open in the winter. (16) If you have water problems in your basement or crawl space, clean up affected areas as quickly as possible and take immediate steps to resolve the source of the problem. Renters, report all plumbing leaks and moisture problems immediately to your building owner, manager, or superintendent. In cases where persistent water problems are not addressed, you may want to contact local, state or federal health or housing authorities.